Post our dinner debacle at Maharaja Restaurant in Milwaukee and after half a day of intense grieving over our bad Karma, we decided to bury the memory and check out Vishnu Vilas on Saturday night. 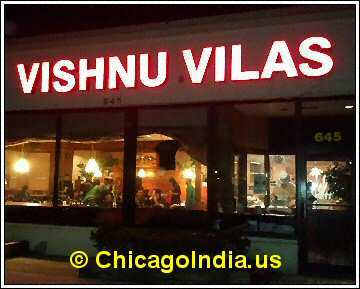 Hey all ye GPS owners, Vishnu Vilas is located at 645 E.Algonquin Rd in Schaumburg, a suburb 25 miles from Chicago. It has its own free parking like any suburban restaurant ought to. 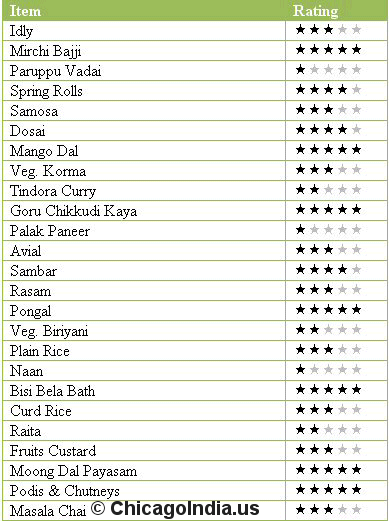 Also, Vishnu Vilas is one of the few Indian restaurants here specializing in South Indian cuisine. 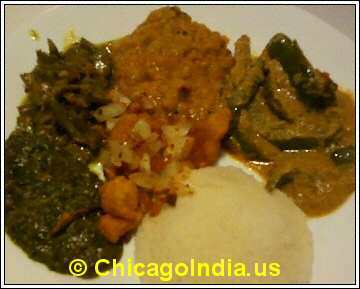 In a bid to cast its net wide, the restaurant also serves some North Indian items and non-vegetarian dishes. As we parked, we could see the place was busy and there was a line of disorganized desis trying to stomp over each other to grab a table. Ha ha, any surprise in seeing desis stomping over each other to get ahead? Par for the course, actually. The place has the most outdated style and decor, very basic but bearable furniture, tables so close to each other that one can rub against the lady behind without a shred of guilt or shame. Putting my perverted thoughts aside for just a while.. the place was thankfully brightly lit and not-so-thankfully over-crowded for its size. Obviously they care a hoot about comfort and would rather squeeze in 15 extra people. 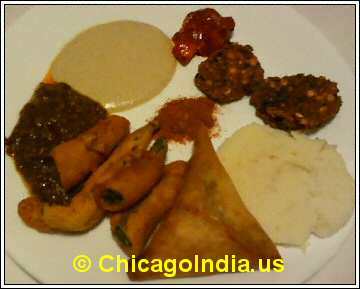 Vishnu Vilas is one of the rare desi places that offer an elaborate dinner buffet with exquisite choices. Like rabid dogs, we swiftly passed all the obstacles, stepped on a few shoes and nudged aside the slow walkers in our frenzied sprint toward the crowded buffet for the first round. We started off at the Chutney counter where we were presented with a cornucopia of Chutneys and Podis – Paruppu Podi (Dal Powder), Idly Milagai Podi (Dal - Red Chili powder for Idly), Gongura Chutney, Pottu Kadalai Chutney, Tangy Onion Chutney, Oil, Ghee, Mixed Vegetable Pickle, Paruppu (dal) and a few other Podis (powders). Alas, the Coconut Chutney container was empty. We grabbed a few Milagai/Mirchi Bajji, Samosa, Paruppu Vadai and an Idly. The spice level was uniformly medium - high and all items had a unique Andhra flavor. The Pottu Kadalai Chutney left a wonderful mild salty, powdery, tangy feel while the Tangy Onion Chutney rocked our senses with its spicy sour flavor. Paruppu was homely. Milagai Bajji gave us the thrills - seasoning of red chili power with baked onions layered with the fried batter and the juicy spicy chili inside was quite an experience. The Paruppu Vadai was over-fried but the effect on our palate still bearable. The buffet table is still crowded. The Coconut Chutney container is still not refilled. WTF are you and your minions doing, we silently yelled at the management. A mere 5 Idlys remain, the guy ahead of me almost grabs the serving utensil from the person ahead of him, grabs 3 Idlys, looks at me from the side of his eyes and takes one more and then the cheap b*stard looks at me directly as if asking if he could take that one too. History will note that I, Braveheart, did not relent. I grabbed a few more Mirchi Bajjis, Goru Chikkudi Kaya Curry, Mango Dal, Veg. Korma and Palak Paneer. Idly was good and Mango Dal was delightfully tangy and indulging but the pick of the items was Goru Chikkudi Kaya Curry - Awesome taste, great combination of spices, melted in my mouth left me in an orgasmic fit. Oooh, aaaahh! The Veg. Korma would have tasted better had it been renamed Mirchi ka Salan. Palak Paneer was atrocious! It was burnt alive, a blemish in an otherwise satisfying dinner so far. Aromatic and evenly cooked Bisi Bela Bath, a favorite from the South Indian state of Karnataka, made its way to our stomach touching every single taste bud leaving them making heavenly music like Mozart. 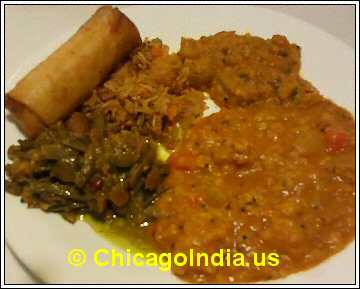 Some more of the yummy Mango Dal and Goru Chikkudi Kaya Curry. Veg. Biriyani, spicy but spoiled by unevenly cooked rice and not warm enough either. Downer! Wow, a Halley’s Comet in an Indian restaurant – Tasty Spring Rolls make special appearance to the buffet as a replacement for the ubiquitous Samosas. Naan bread was disgustingly thick, cold and slightly burnt but the delightful Pongal acts as a soothing balm on our anger. Coconut Chutney has been refilled and it looks and tastes every bit as authentic as I would find in the hotels of Chennai. Thick and fresh. Double Surprise!! Dosai is available on demand!! Now, how can we insult them by not ordering one? The waiter generously serves two Dosais instead of the one that I asked and what a deadly, divine combination with Coconut Chutney. Yes, GOD exists! Today, in the form of Dosai! We have a few nibbles of the passable Tindora curry cooked with peanuts. These idiots should put up a warning somewhere considering the number of people with peanut allergy. The onion-heavy Raita spoils the taste. Curd Rice is ok. The rice should have been mashed more. Fifth and final round - Desserts! Fruits custard, the uneven temperature killed the taste but thankfully the Moong Dal Payasam is just around the corner. While it is nowhere in my list of favorites, the Moong Dal Payasam was surprisingly good. Not too sweet, perfect temperature, correct density, evenly cooked and a pleasant way to end a grand weekend meal. For the excellent food they serve and the number of patrons they have, the cheap rascals should make their staff wear gloves to refill the buffet and provide better spoons, forks and glasses. They serve water in cheap old plastic glasses and their spoons and forks are straight out of 1980's. They had an unexpectedly big group visiting and the Owner/Manager was walking around with a piece of paper noting down names and phone numbers. Can't these bozos have some basic system to take reservations? However, in a rare gesture of humility for desi restaurants, the owner apologized to patrons at every table for the confusion caused. They also had the courtesy to check with all the patrons before closing the buffet when it was time. Buffet was crowded at all times but then that’s probably a reflection of the wonderful food. Folks, it’s a sin not to dine at Vishnu Vilas! Hog like a pig, 25+ choices for $11.99 is the best value for money you will ever get.